Sean Guerrero is a shareholder with the firm. He grew up in San Antonio and received his undergraduate degree from the University of Texas in 1996. In 2001, Sean received his law degree from Texas Tech University. 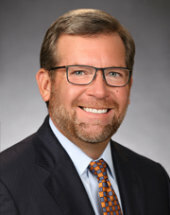 He has practiced in Midland since 2002, focusing primarily on commercial, oil and gas litigation, and defending corporate clients involved in oilfield accidents. Sean assists clients in dealing with the OSHA inspection and citation appeal process, as well as advising oilfield companies with their relationships to their insurance carriers and master service agreement partners. Sean is licensed in state court in both Texas and New Mexico. In Federal Court, Sean is licensed in the Western and Northern Districts of Texas as well as the New Mexico District Court.